Since 1937, Heat-Timer Corporation has set the standard for heating-control systems in NYC buildings, starting with the introduction of the world’s first weather-actuated controls. Decades later, Heat-Timer ICMS Internet Control Management Systems are helping New York property owners stay afloat despite rising fuel costs and limited manpower. 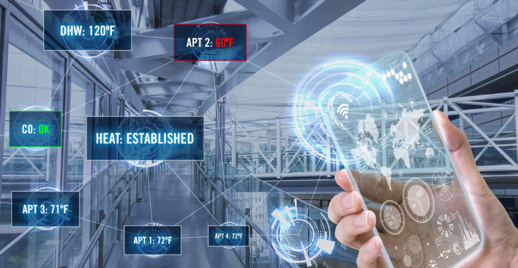 Today, these and other Heat-Timer control innovations are found not just in New York, but in buildings throughout the world, including: apartment buildings, government buildings, schools, hotels, factories, offices, religious buildings, and homes. This electronic tempering valve accurately regulates water temperature for a wide variety of applications. In commercial buildings, the ETV Platinum Plus is primarily used in domestic hot water applications for tempering water from the heaters, the return loop and domestic cold-water makeup. The large, easy-to-read display and user-friendly adjustment module can be located conveniently, up to 500 feet from the valve. This allows outlet water temperature to be monitored at a glance and for the temperature to be adjusted without having to access the valve piping. 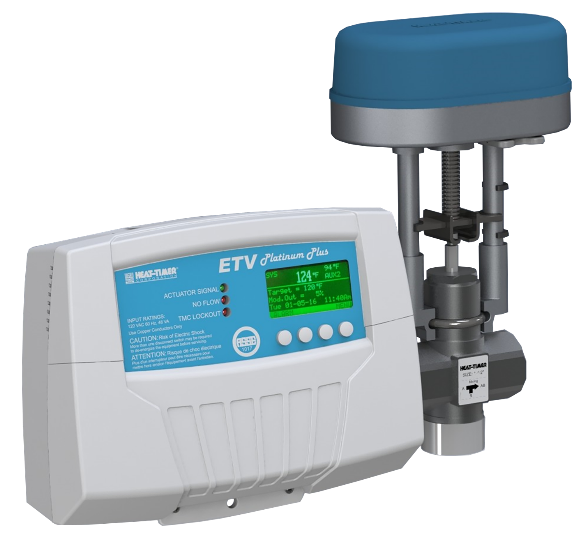 The ETV Platinum Plus combines a rugged stainless-steel or bronze valve body, a reliable electronic actuator and a control module. The control module constantly monitors the outlet temperature of the valve which is constantly displayed and can be read across the room in virtually any lighting conditions. Based on the set point, which is user-adjustable in 1° increments, the control employs PID-type logic to adjust the signal sent to the actuator. The actuator mounts directly to the valve body and mixes the hot and cold water required to produce the desired outlet temperature. The control quickly restores the desired water temperature, even after large changes in load conditions, with a minimum of fluctuation. This makes the ETV Platinum Plus ideal for applications with sudden load shifts or where an outlet water return cannot be piped into the cold-water supply of the valve, challenging applications in the same inexpensive, easy-to-use package. The Internet Communication package allows you to monitor and adjust any internet-ready Platinum Series heating control from any internet browser. All the operating and recording software is contained within the panel. This means the control can be accessed from any computer with an internet connection. The Internet Communications package allows you to monitor the control and provides extensive histories of system operation. In addition, Internet Communications allows you to have complete control; you can change any setting that could be changed at the control location, and the remote settings override any subsequent changes made at the control location. Furthermore, automated reports can be emailed to your computer daily, weekly or monthly. A major advantage to the Platinum Heat-Timer Internet controls is their ability to function independently. This means that even when the internet is down, the control will function based on its settings. Settings can be changed locally when proper security rights are granted.